Adrien Comeau - VE3IAC: Silent Lake Yurt "DX expedition"
It is time to get the ham radio out in the wilderness again and operate portable for a few days. The park is about 240km due west from Ottawa where we live. The drive will start early Sunday morning so that we can arrive at the park entrance at about noon time. From the park gate we will drive to the park Warden's office where we will transfer the camping contents of the truck to snowmobile for the remainder of the trip into the winter camping areas of the park. Silent lake park is located in eastern Ontario, not far from the eastern sea coast of North America. The key radio equipment will be an ICOM 7000 which is a compact 100W HF and VHF radio. Antenna tuning, if needed will be delivered with an LDG AT-7000 auto tuner. Power plant will be 4 50AH 12V Gel-cells. 200AH should provide me with about 18 hours of operation. The battery booster will "step-up" voltage from the gel-cells to a stable 13.5V even as the gell-cell discharge. This helps the radio perform. The efficiency used in the calculation below is 80% and the booster is only enabled on tansmit. HF Antenna will be the Buddipole, I have a configuration for 20m and 40m. Both are L shaped. 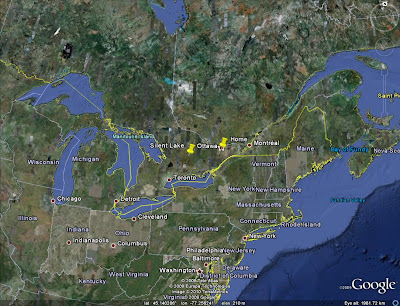 I'd like to have a chance to hit the repeater near by and link with IRLP back to Ottawa. The nearest node is imaged below. There are really only two nodes which are candidates within 50km of the park. Plans are to operate 20m during the day, and 40m in the evening. I will be equipped to operate PSK and a SSB. I will not be able to operate VHF and HF at the same time as I will only have the 1 radio. This is my packing list for the the expedition. Pretty darned cool, literally and figuratively. Glad I could be a contact during this "DX Expedition"!